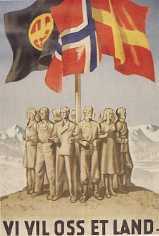 The political party ”Nasjonal Samling” (National Unity) was formed in Oslo on the 17th May 1933, with Major Vidkun Quisling as leader, and State Attorney Johan Bernhard Hjort as second leader. At that time, Quisling was 46 years old, and Hjort was 38. This party was quite different than the other Norwegian political Parties at that time, and very clearly based its politics on a ”leader” (fører) system, quite far from the democratic standards in Norway. The N.S Party Program clearly stated the abolishment of all political parties; only one was to exist: N.S. Vidkun Quisling was a remarkable person, with visions that only seldom fitted the real life. He had worked together with the famous Frithjof Nansen in Soviet, during the famine in the 1930´s, and had a reputation for being an intelligent, quiet and hard-working man. He saw himself as a philosopher, and created a new philosophy: the Universism. This was a strong mixture of spiritual and ideological elements: the Individual was to find personal salvation and freedom in a close co-operation between inner meditation, God and the Society. Quisling even made plans for a world-wide organization: The World Univerism League. He had also served as Minister of Defense in the Agrarian Government 1931-33. Symbols and expressions within N.S were taken from Norwegian Viking traditions. The main N.S symbol was an encircled Golden Cross on red background, the “St. Olav´s Cross”. The party was organized in a ”National Organization” (Riksorganisasjon), a Woman Organization, (NS Kvinneorganisasjon), a Combat Organization (NS Kamporganisasjon), a Youth Organization, (Nasjonal Samlings Ungdoms-Fylking – NSUF) and the Hird. The latter was to be the hard-core political uniformed storm troops of NS, and equivalent to the German S.A. The first Hird Commander (Rikshirdsjef) was J.B Hjort, later succeeded by Captain Oliver Møystad. Col. Konrad Sundlo periodically acted as a stand-in. During the elections in 1933, Nasjonal Samling had a co-operation with the Farmers Aid organisation, (Bydgefolkets Krisehjelp), and they two finally got 27 850 votes. This was quite a huge number, since N.S only had existed for 4 months. At the county elections in 1934, N.S continued their success, especially in Stavanger where the local leader Gulbrand Lunde, a young and popular politician, finally collected 2558 votes for the Party. In the early days, Nasjonal Samling was deeply religiously rooted, and gained relatively huge support from both the Church and the religious parts of the population. As the party grew more militant from 1935, the pro-German and anti-Semitic section of the Party got more power, and N.S lost most of their influence in the Church. At the elections in 1936 N.S only got 26 577 votes. This was one of the reasons to the bitter conflict between Quisling and Hjort; the latter finally left the party together with several prominent members, as Hjort had many followers. From now on, Nasjonal Samling clearly moved from being a Party to getting more like a sect. In the early days, N.S had a very distinct Nordic profile, and in many ways gave an impression of wanting to revive the ancient Viking regime in Norway. The Party hardly had a foreign policy at all, even If Quisling did attend the Italian-led “International Fascists Convention” in Montreaux in 1935, together with colleagues like Anton Mussert, Frits Clausen and Oswald Mosley.” Soon, members who admired Mussolini´s Italian fascist regime, and even Hitler’s Germany, showed a clear Germanic attitude. Quisling, who saw himself more a Prophet than a politician, hardly ever participated in debates or discussions. He mostly communicated in writing. This absence of leadership made National Samling a party of intrigues and rivalry at the costs of effectiveness. The number of members in N.S is very difficult to estimate. A research by Bergen University in 1976, stated that only 2000 remained as members after the German invasion on the 9th April 1940. This number is, however, regarded as far to low in other researches. After the Invasion, the number of members grew to an estimate of 50 000, with an additional 6000 from NSUF. The number might even have been as high as 60 000. During 1944-45, some members left the Party, and some were excluded, but in no large numbers. Nasjonal Samling had a political program, which clearly was Nationalist to the extreme, and it also became more and more influenced by the German N.S.D.A.P. However, in the Party program dated 1937, Quisling stated that Nasjonal Samling had nothing to do with N.S.D.A.P, and the NS-newspapers denied all accusations of a racial based politics. N.S was, as quoted, a ”Deeply rooted Norwegian, National, Spiritual and Christian movement.”. Quisling often even stated that he had inspired Hitler to crate his ideology, since Quisling had created his political philosophy as early as in 1917-18. 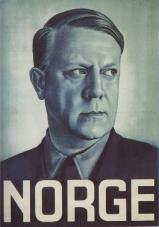 The first ad hoc government, which Quisling suprisingly announced on the chaotic day of 9th April 1940, came as a surprise, and the statement shocked both the Germans as the Norwegian population. Actually it did even shock most members of the Government, as most were unaware of Quislings plans. It proved short-lived – and lasted only for five days. Quisling never impressed the Germans, but had some support too: Alfred Rosenberg was enthusiastic about him, and prominent members of the German Navy, like Admiral Raeder also supported Quisling. This, together with Quislings personal appearance, made the relationship between the German leader in Norway, Reichskommisar Joseph Terboven and Quisling extremely bad. Vidkun Quisling, born 1887, Major. MBE. Birger Meidell, born 1882, professor and a member of The Norwegian Science Academy. Gulbrand Lunde, born 1901, Dr. Chem and Scientist. Albert Viljam Hagelin, born 1881, businessman and opera singer. He had lived in Dresden for 28 years. Hagelin, born in Bergen, was relatively unknown to N.S members before 1940, but quickly became one of the most powerful men in the Party. Tormod Hustad, born 1889, architect. Ragnar Skancke, professor and member of The Royal Norwegian Science Company. Anton Fredrik Prytz, born 1878, officer and owner of a large land estate in Fosen, Trondhjem. He was one of Quisling’s closest personal friends. Sverre Riisnæs (born 1897, Cand. Jur.). Jonas Lie (he had left the Party in 1935, but rejoined N.S on this day). Sigurd Halvorsen Johannesen, born 1881, was never a N.S member. His profession was being an officer in the Merchant Navy. Kjeld Stub Irgens, born 1879. Naval officer and a friend of the Royal family. Thorstein Fretheim, born 1886, veterinary of profession. Axel Stang, born 1904. He owned large land properties, and was actually the first Norwegian to join ”SS-Regiment Nord” (June 1941), serving at the Salla Front, and he finally received the Iron Cross II. Øystein Ravner, born 1893, engineer. Never an NS-member. On the 25th September all these men got the title of Minister, and this title was also given to the General Secretary of N.S: Rolf Jørgen Fuglesang, a young and popular man. He was the former leader of the “University Students N.S Organisation). When Quisling, now bearing the title of ”Ministerpresident” appointed his permanent government on the 1st February 1942, Sanberg, Johansen and Ravner left the Government. Anton F. Prytz got Minister of Finance, Eivind Stenersen Blehr (b. 1881, Cand.Jur.) got Minister of Trade. After the accidental death of Gulbrand Lunde on the 25th October 1942, Rolf Jørgen Fuglesang succeeded him. Hans Skarphaugen, b. 1888, professor. Arvid Vassbotten, Judge of the High Court . Trygve Dehli Laurantson, appointed Minister of Agriculture on the 21st April 1945. When Minister of Finance Prytz died in 1945, Per Einarsøn Von Hirsch, born 1902 succeeded him. The latter never joined, so a new Judge was appointed instead: Birger Motzfeld, b. 1904. Quisling, Hagelin and Skancke: death penalty. The latter, executed in August 1948 at the age of 58, was one of the last to get shot in Norway after receiving death penalty. Stang, Lippestad, Fuglesang, Hustad, Meidell and Whist: lifetime imprisonment. Fretheim, von Hirsch, Skarphagen, Vassbotten and Blehr: 20 years imprisonment. Lie died of unknown reasons on the same day that the Germans surrendered, and Riisnæs was institutionalised due to insanity. Released from the Hospital in the 60´s, he spent most of the seventies in Italy and Vienna, and finally died in Oslo,1987. The last N.S prisoner was released in November 1957. 46 085 members of N.S got sentenced, and about 23 000 of them were imprisoned. 4800 of these were so-called “Frontfighters” (Frontkjempere). 90 000 individuals were investigated. * A quote by Leif Schjøren, the ex-Staff Chief of GSSN: ”Not many of the ”members” in GSSN were actually really members, because the rules said that first you had to serve as an ”aspirant” for one year, and you also had to have the ”genetic papers” checked and found OK. The latter was mostly not possible during the war”. * According to Schjøren (also Karl Leib), Jonas Lie was never interested in the political aspects at all. This concerned the German SS authorities, and they later (unsuccessfully) tried to replace Lie with Sverre Riisnaes. Jonas Lie only saw GSSN as a) a combat unit and b) the opportunity to create a high-quality formation for police use. * One fact, that caused serious conflicts between Nasjonal Samling (NS) and GSSN, was the considerable number of Freemasons in NS. Quoted by Rolf Fuglesang. * Leif Schoeren was enlisted into Waffen SS, and sent to Berlin on the 22 March 1945 (more or less voluntarily). He actually strayed around in Germany during the chaos until the Americans in Frankfurt am Main arrested him. He was at that time together with Egil Holst Torkhildsen. The latter escaped to Argentina. “Aufbruch” (the Norwegian version was named ”Avis for det germanske front,- og kampfellesskap”), "Munin", “Fritt Folk”, “Fronten”, “Germaneren”, “Germania”, “Germansk Budstikke”, “Germansk Maanedshefte” (2 issues only), “Hirdmannen”, “Hirdspeilet”, “Ideologisk Maanedshefte for Hirden”, “NS Maanedshefte”, “Norsk Folkeblad”, “Norsk-tysk tidsskrift”, “Ragnarok”, (this paper was a thorn in Quisling’s side. 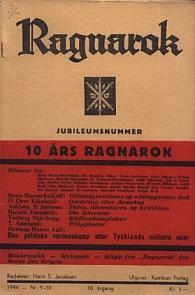 Highly pro-German, quite anti-Quisling) “Skuggsjaa”, “NS-heftet”, “NS Leitheft”, "Heim og Ætt (NS women, edited by Olga Bjoner) and "Norsk Ungdom"
To the right: Ragnarok. -A thorn in Quisling's side. and has written many articles for other ww2 sites. All pictures/material unless otherwise stated, are owned or supervised by NDWW2/NUAV's webmaster. You are not allowed to copy, publish or in any way distribute material from these pages without the webmaster’s written permission.This site do not represent any kind of political statement, it is made by people with the historical interest of Norway in the period between 1940 - 1945. Copyright 1999, 2005 © Kurt Monsen.